In view of God's mercy: Friday is for Fotos: Twins Update! 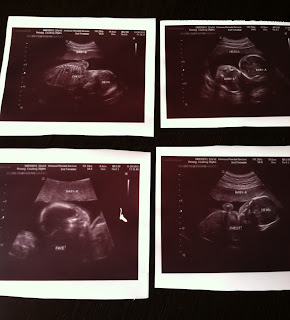 Yesterday we had another ultrasound and visit with my high risk doctor. Ultrasound visits are my favorite. While I love hearing their heartbeats at my other doctor's office, there is nothing like seeing them moving right before my eyes. 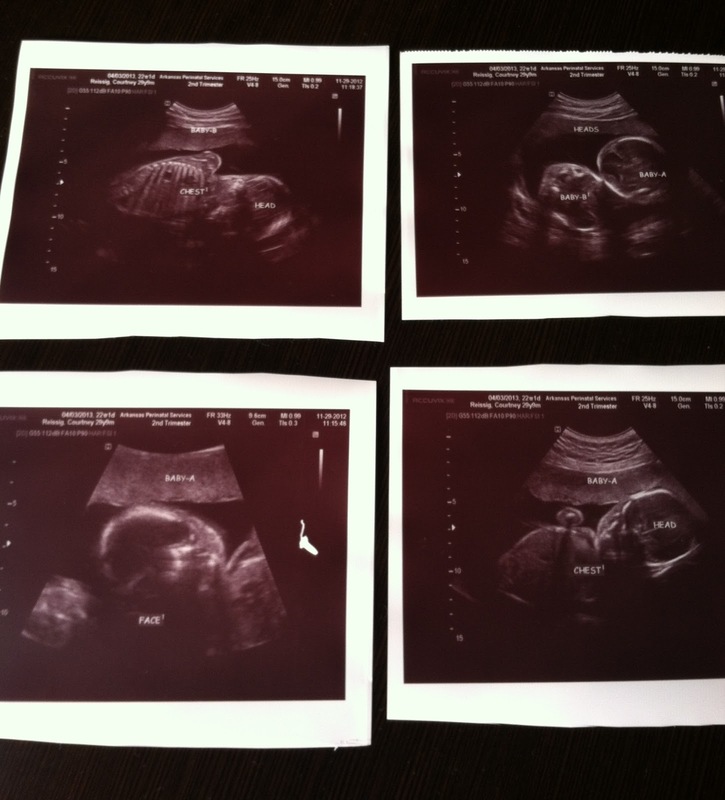 The boys don't usually cooperate to get good profile shots for their ultrasounds. This week was no different. They are just so busy they don't have time for photographs! Luke is in the picture on the top right. He is still measuring smaller than his brother, but he doubled in weight from the last visit a little over three weeks ago. The doctor still assures us that this is completely normal since he is trending well. He weighs in at approximately 14 ounces! He is the least interested in having his picture taken. He just likes to hang out and move around. Zach is in the picture on the bottom right. He is a little more camera happy. He also is a mover and a shaker. When my other doctor listened to his heartbeat on Monday he could hear him moving before he could even find his heartbeat. He was like "I know he is in there, he is just moving around so much!" He is going to be a busy little guy. He weighs in at a whole pound and 2 ounces! Their two heads are in the top right picture. It's the only picture we can get of the two of them together anymore. They are too big for one picture now. I guess they will just have to wait until they are born! Zach's face is the bottom right picture. It's hard to tell what he looks like because it's so fuzzy, but it is just such a precious picture to me. This is my boy's face and I love it already. Luke wouldn't let us take a face picture. He likes to turn away when those ones are taken! All in all everything is going well. I feel pretty good now. And besides the fact that I am getting bigger by the minute, my discomfort level isn't too bad. I can feel them move every day, and I must say that this is my hands down favorite part of being pregnant. It overwhelms me to feel these little boys moving around. Daniel felt them move for the first time a few days ago and his reaction was priceless. We just love them so much already. As I reflect on the fact that I have made it this far with these boys I am again brought to my knees in thankfulness to our great God. Every moment with them is a gift and we cannot wait to meet them!